What do I do when vector data don’t line up? Plot vector objects with different CRSs in the same plot. In an earlier episode we learned how to handle a situation where you have two different files with raster data in different projections. Now we will apply those same principles to working with vector data. We will create a base map of our study site using United States state and country boundary information accessed from the United States Census Bureau. We will learn how to map vector data that are in different CRSs and thus don’t line up on a map. We will continue to work with the three shapefiles that we loaded in the Open and Plot Shapefiles in R episode. We often need to gather spatial datasets from different sources and/or data that cover different spatial extents. These data are often in different Coordinate Reference Systems (CRSs). The data are stored in a particular CRS convention used by the data provider (for example, a government agency). The data are stored in a particular CRS that is customized to a region. For instance, many states in the US prefer to use a State Plane projection customized for that state. Notice the differences in shape associated with each different projection. These differences are a direct result of the calculations used to “flatten” the data onto a 2-dimensional map. Often data are stored purposefully in a particular projection that optimizes the relative shape and size of surrounding geographic boundaries (states, counties, countries, etc). In this episode we will learn how to identify and manage spatial data in different projections. We will learn how to reproject the data so that they are in the same projection to support plotting / mapping. Note that these skills are also required for any geoprocessing / spatial analysis. Data need to be in the same CRS to ensure accurate results. We will continue to use the sf and raster packages in this episode. There are many good sources of boundary base layers that we can use to create a basemap. Some R packages even have these base layers built in to support quick and efficient mapping. 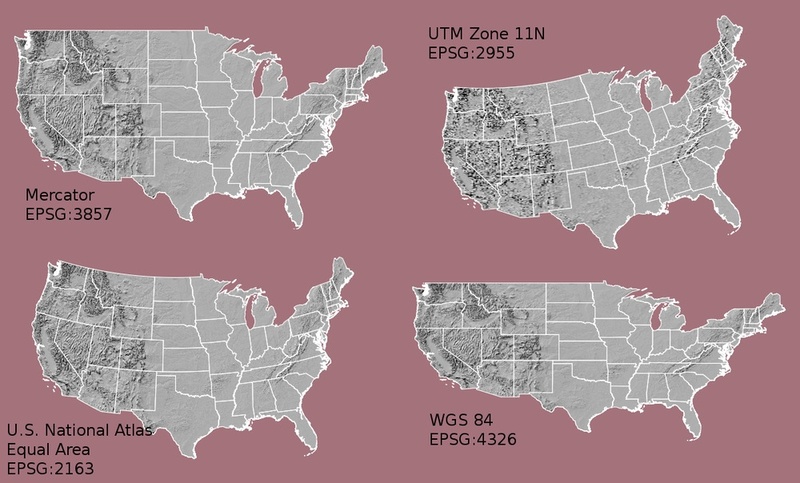 In this episode, we will use boundary layers for the contiguous United States, provided by the United States Census Bureau. It is useful to have shapefiles to work with because we can add additional attributes to them if need be - for project specific mapping. 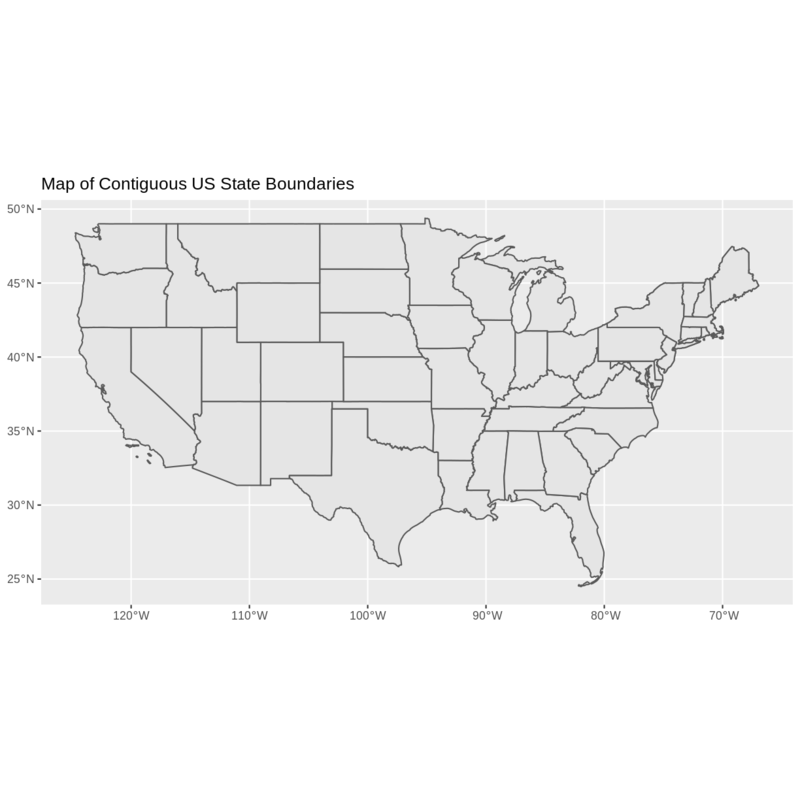 We will use the st_read() function to import the /US-Boundary-Layers/US-State-Boundaries-Census-2014 layer into R. This layer contains the boundaries of all contiguous states in the U.S. Please note that these data have been modified and reprojected from the original data downloaded from the Census website to support the learning goals of this episode. We can add a boundary layer of the United States to our map - to make it look nicer. We will import NEON-DS-Site-Layout-Files/US-Boundary-Layers/US-Boundary-Dissolved-States. If we specify a thicker line width using size = 2 for the border layer, it will make our map pop! We will also manually set the colors of the state boundaries and country boundaries. units=m: the units for the coordinates are in METERS. the last portion of each proj4 string is +towgs84=0,0,0 . This is a conversion factor that is used if a datum conversion is required. We will not deal with datums in this episode series. Next, let’s view the extent or spatial coverage for the point_HARV spatial object compared to the state_boundary_US object. And then the extent for the state boundary data. Note the difference in the units for each object. 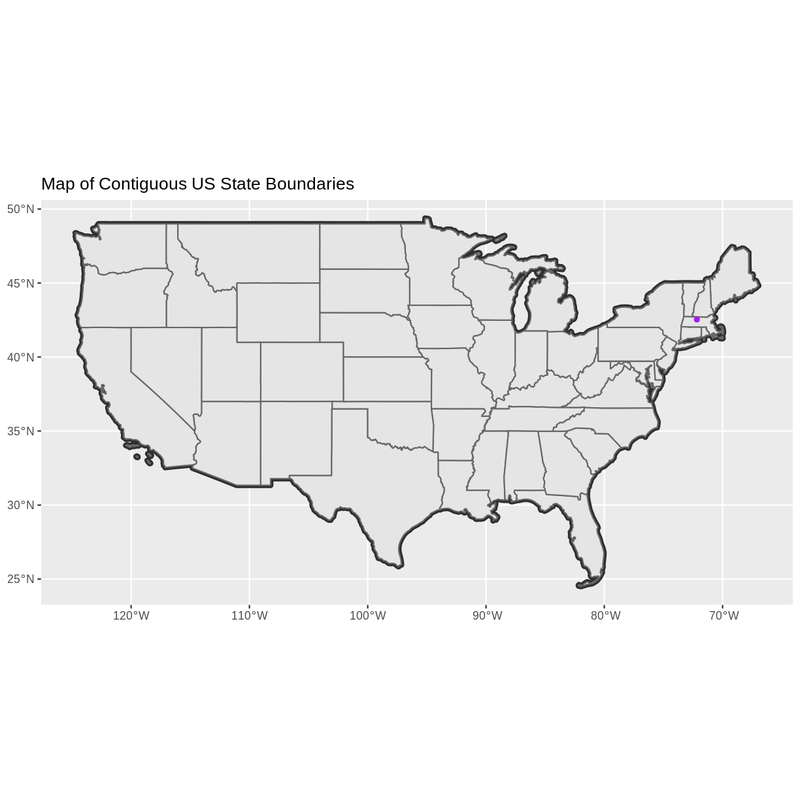 The extent for state_boundary_US is in latitude and longitude which yields smaller numbers representing decimal degree units. Our tower location point is in UTM, is represented in meters. More information on the proj4 format. A fairly comprehensive list of CRSs by format. Reproject Vector Data or No? Import and plot Boundary-US-State-NEast.shp. Adjust line width as necessary. 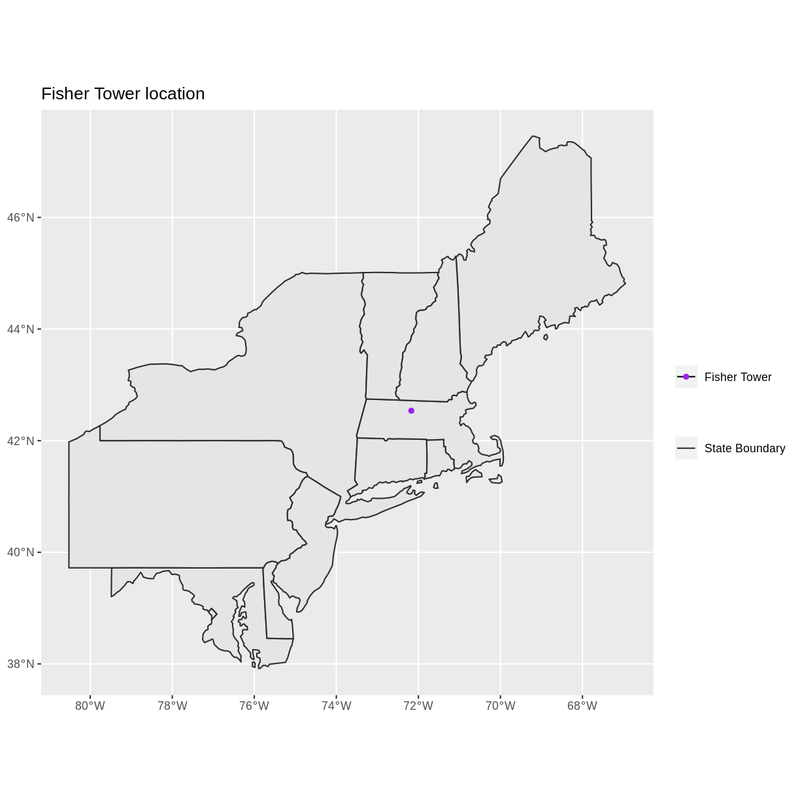 Layer the Fisher Tower (in the NEON Harvard Forest site) point location point_HARV onto the plot. Add a legend that shows both the state boundary (as a line) and the Tower location point.